We are updating our website and adding some new cards so check back often!! This site was last updated 04/01/2012! We are in the process of adding some EX cards to our unlimited page. We also just found a box of 1st Edition Fossil Cards and have acomplete set ready for sale! We are still up an running after 11 years!!! Browse through our cards and see what you want/need to complete your sets or decks. Remember you gotta catch'em all! 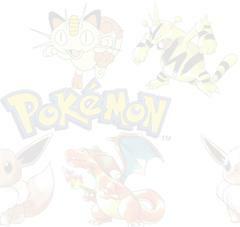 We have been selling Pokémon Cards on Yahoo and have over 300 Excellent Feed back. On the top of this page are links to the different series of cards we have. We update the site often adding new cards, so check back often. For Your Protection we are Paypall Verified! Thank you for stopping by! If you are under age 18 please get your parents permission before giving your name and address to anyone on the internet. We want everyone to enjoy our cards. We can provide excellent referrences upon request. 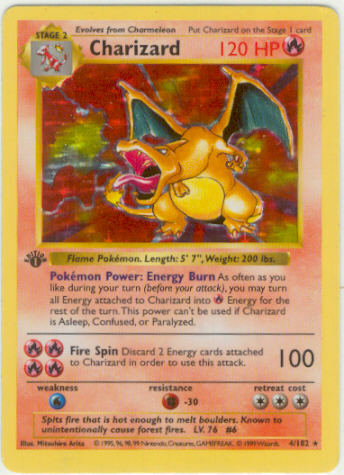 We have a very mint condition 1st Edition Base Charizard for Sale. Please Email if you are interested in this very special card. We pulled this card from a pack several years ago, he has been in a soft sleeve and a screw down case since we opened it. If you are interested in this card please email us at petekun@hotmail.com for details. Click on the picture to see a bigger picture. For those of you collecting the Japanese Promo cards, we have some super rare cards. The ANA Airlines ANA'98 (Pikachu,Dragonite) ANA'99 (Pikachu,Articuno) cards pictured are still in their original folders, the cards and the folders are in mint condition. Click on the picture below for a larger picture of the cards.